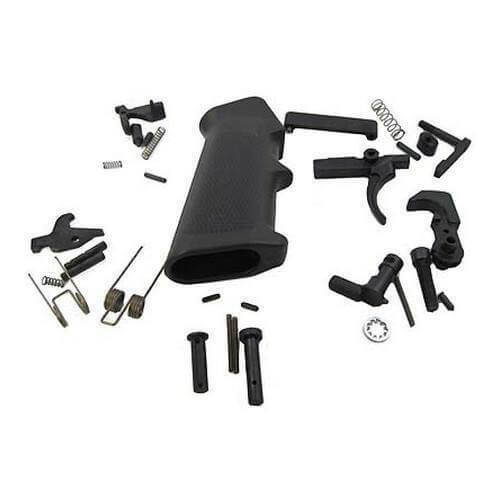 Color coded bags and an easy-to-use parts list will save you time and frustration with this excellent Lower Parts Kit (LPK) for AR-15. It includes a pistol grip, fire controls and pins necessary to complete stripped lower – everything but the stock and the lower receiver. All parts are Mil-spec and well packaged. I received exactly what I ordered and delivered on time. Awesome lowers parts kit. Made it so easy to do a home build when everything was separated and put into color codes bags. Will definitely buy again. I made my first purchase at www.at3tactical.com, and I can say that I am for the most part very satisfied . I purchased a CMMG Lower parts kit and, a two-piece drop-in GM-QR1 AR-15/M4 hand guard . Shipping was very fast and I got the CMMG LPK for a great price. But the GM hand guard (although very similar to the one I ordered), was not the one I seen before or the one shown on your website, I looked at other websites including GM official website to see if perhaps I was getting an older or new version of the hand guard, but all of them show the same item you have on your website. The item did not come with GM labels and was assembled unlike the ones I seen that come with the two pieces unassambled and the Allen Wrench to tight the 4 screws. I will like to thank you for taking the time to ask customers for feedback and reviews on recent purchases!